At the Johnny Tightlips show on Saturday night, friend Brian and I were talking about how much cleaner and generally less disgusting bars/clubs are now, thanks to the new no-smoking laws. I spoke too soon. Last night I found that Club Sound/In The Venue is just as sweaty and gross (and a bit smokey) as ever. Nevertheless, I had a great time at Matt & Kim. So many choices on Monday night. Should I give into my late-90s nostalgia and head down to Orem for Blink-182? 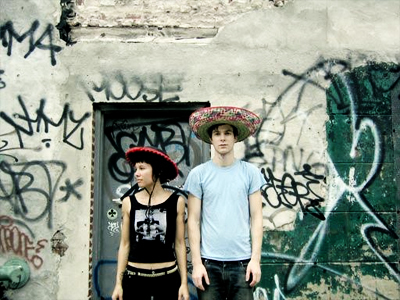 Or should get my boogie on to Matt & Kim in Salt Lake? Since I’d seen both bands before, and have been impressed by both, the tie breaker went to my dancing heart. Though I’m sure that Blink was filled with plenty of spectacle, power chords, and pooh jokes, I have no regrets about choosing Matt & Kim. I'm guessing the 300 or so fans sweating to death in the unventilated Club Sound would agree. The set was short and sweet, lasting just under an hour. Despite the brevity, the smiling duo managed to play the majority of its two-album catalog as well as throw in a fist-pumping rendition of the made-famous-by-hockey "Hey Song" and the greatest song ever written--that's right, "The Final Countdown." With so many great songs, it's hard to pick favorites. However, both the rapid-fire instrumental "Cinders" (played in double time as a reward for "such a great crowd") and the heartfelt "Light Speed" were outstanding. "Daylight," the set's closer, was also welcomed with shrieks of delight. Matt & Kim's second most endearing quality (right after their perma-grins) is their gratitude. No matter the size of the venue or the length of the set list, they play as if it was their most important gig and they thank the audience profusely for their support. The usually-silent Kim even took the mic to offer her sincere appreciation to the ever-growing Salt Lake City fan base. In many ways, Kim managed to steal the show. In addition to her incessant drum pounding, she lent vocals to "Lessons Learned," threw in a few keyboard notes on "Turn This Boat Around," and showed off her Beyonce bootyshake during a couple of between-songs dance parties. There was not a dull moment to be had and every face in the crowd left sweaty and almost as smiley as the band itself.